Suspends from hanging file rails. Shallow front sections hold tiny items; large back sections hold oversized items. Vital office supplies are easily accessible. Organizer suspends from standard, hanging file rails for convenient access to drawer beneath. Small, shallow front bins hold paper clips and other tiny items while large back sections hold oversized items like discs, pens and rulers. 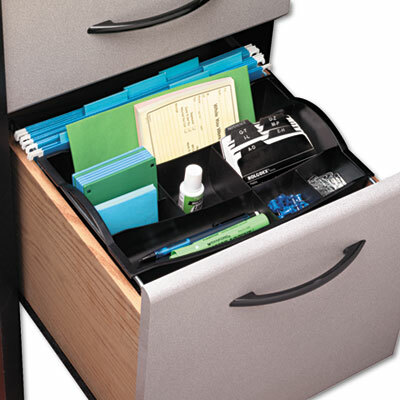 Vital office supplies are arranged in a single, easily accessible location, increasing time management and productivity. Click here to see more Drawer Organizers! Adjustable: No Height: 3 1/4"
Width: 12 1/2" Depth: 7 3/4"